I was born in the middle of a snowstorm, so in some ways, the protagonist of The Bear and the Nightingale, Vasilisa, is a kindred spirit. She is also a youngest child with a healthy streak of contrariness – something I can relate to, for better or worse. But that’s where the similarities end. Vasilisa – or Vasya for short – is a child of the wilderness, the fourth child of a lord in the frigid Russian hinterland. She’s impish, crafty, and gets herself into all kinds of scrapes like a typical kid. But she can also see and communicate with the spirits of the home and natural world, an ability that is both a blessing and a curse. When her stepmother and an attractive young priest campaign to cleanse the village of its demons, Vasya is thrust into the critical role of protecting and restoring the balance. 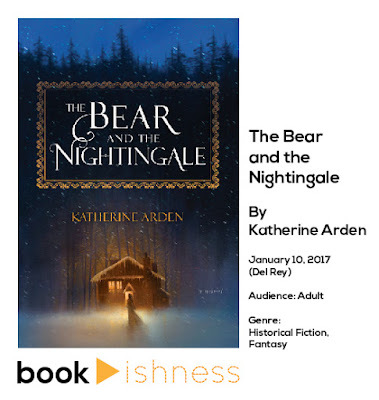 When I started reading The Bear and Nightingale, I initially thought it would be yet another book retelling a fairy tale in a new light. But Katherine Arden’s debut novel is so much more than a clever rehashing. Rather, she does a masterful job of crafting a fresh tale that is haunting and complex, making this one of my most anticipated reads for this year. The book begins with the telling of a story around the family hearth, of the folk character Morozko, sort of a Russian equivalent of Jack Frost. It seems simple and provincial. But from there, the story spirals into one of family love and loss, magic and consequences, of best intentions gone wrong. There is an intriguing overlay of religion, which becomes more a commentary on fear and what it can do to a community. There are many things to love about this book, but one that set it apart from some of my other recent reads is the author’s ability to truly transport the reader into another world. From the first few pages, you hear the crackling of the fire, feel the cold inching in through the cracks of the izba. I found myself getting creeped out by the shadows on my walls. That’s the magic of a masterful storyteller and wordsmith. Arden also does a splendid job with creating characters you care about, in relationships that resonated. From the get go, the fierce love in Vasya’s relationship with her old nurse, Dunya, and her brother, Alyosha, was – in the most uncheesy of ways – heartwarming. The stepmother, Anna Ivanovna, and the priest, Konstantin, are both reviled and sympathetic in their fervor. I found myself particularly captivated by their development, appreciating their depth beyond their seemingly black and white views. The novel holds twists and turns that are worth experiencing for yourself. Curl up next to a roaring fire and get ready to be transported. There are two covers for the book, for the US and UK releases. The US version (top) captures a snowy night well, with the glowing izba amidst the tall trees. The little flairs of the title font with its lacy border evoke the fairytale nature of the novel as well. But I have to say, I prefer the UK version (left). The US one gives a heart-warming feeling bordering on cliché, with little hint at what the book might reveal. The UK one – inspired by a Russian box – seems to better capture the folkloric and magical side of the story, with a hand-crafted feel to both the illustration and typography. But these are my own biases, and both covers capture different aspects that will lure readers in. 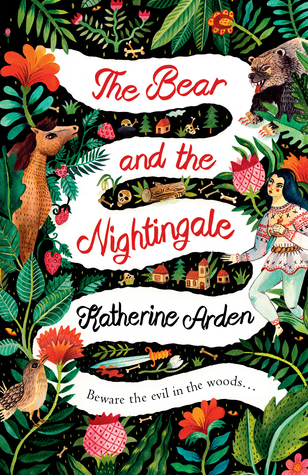 Note: I received a free ARC of The Bear and the Nightingale from the publisher via NetGalley, in exchange for an honest review.